The Arbutus tree (pronounced ar-BYOO-tus) is also known as the Pacific Madrona tree. It is indigenous to the coastal regions of the Pacific Northwest. Tribal communities used the tree for medicinal purposes, including making preparations from leaves and bark for colds, skin aliments, and as a digestion aid. They also used fruits for food and wood for implements and firewood. Many mammal and bird species feed off the berries, including American robins, cedar waxwings, band-tailed pigeons, thrushes, quail, mule deer, raccoons, ring-tailed cats and bears. 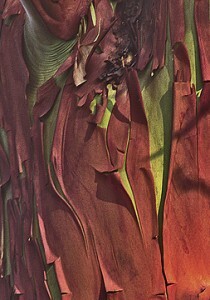 The bark of the tree has a unique characteristic: each year, the brown, papery bark peels away exposing a silky-smooth, green skin underneath. The dramatic visual contrast can be spectacular and beautiful – and to us, symbolic of a “green” economic renewal as well.